SAMMAMISH, Wash. — A photograph displayed in Jacki and John Williford’s home commemorates a camping trip that would go down in family history. The most memorable event from that outing in 2011 involved the mussels John and his two children collected from a dock near Sequim Bay State Park on Washington’s Olympic Peninsula. The family took them back to their campsite and steamed them in white wine with garlic and oregano. But his little sister’s memories of that day aren’t quite as fond. The mussels the Willifords ate around the campfire that night were indeed poisoned. But it was a natural type of poison. The shellfish had sucked up a toxin produced by a certain type of algae called dinophysis. Dinophysis has been found around the world and documented in Northwest waters for decades. But scientists think it’s becoming more toxic as ocean conditions change, in part due to climate change. Every year during the warmer months, blooms of algae dot Northwest waters. Some types of algae can release toxins, which poison shellfish and the people who might eat those shellfish. In recent years, toxic algal blooms have been more potent and lasted longer. That has scientists trying to understand how our warming climate could be contributing to the problem. But for the Willifords, the science is already hitting close to home. The Williford’s encounter with what turned out to be diarrhetic shellfish poisoning wasn’t pretty. Soon after their youngest went to bed that night, Jacki and her husband John heard sounds of vomiting coming from the tent. After a long night spent using pillowcases, towels and every spare article of clothing to clean up the mess, the Willifords decided to cut their vacation short, pack up their things and head home. It turns out there wasn’t much public health officials could have done to prevent this family’s experience. 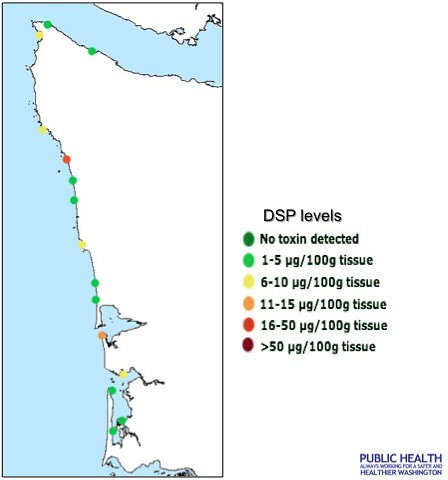 The DSP toxin is expensive to detect –- and there had never been a confirmed DSP poisoning in the United States –- although it has made people in Europe and Japan sick. 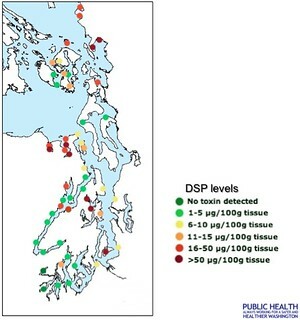 The Washington Department of Health works with tribes and shellfish growers to test regularly for other naturally occurring toxins in shellfish. Other native algae produce toxins that can cause paralysis and amnesia. It was only recently that dinophysis joined the ranks of algal troublemakers in the Northwest but it may be perfectly equipped to thrive in our changing waters. Neil Harrington watches the waters more closely than most. As a biologist for the Jamestown S’Klallam Tribe he monitors shellfish every week for toxic algae contamination. Today he’s taking samples from the very dock on Sequim Bay where the Willifords harvested their toxic shellfish in 2011. Harrington pulls up a cage full of mussels and oysters and starts picking some out for sampling. These shellfish, alongside water samples from this site, will be taken back to his lab to test for algae-related toxins. Some samples will also be overnighted to the Department of Health lab in Shoreline, Wa., which is a clearinghouse for the latest information on shellfish bed closures. Harrington is particularly curious about dinophysis. Unlike a lot of algae that just float around and photosynthesize until the water turns phosphorescent or red or green, dinophysis has two tails that allow it to swim through the water. That means it can photosynthesize like a plant and prey on other single-celled organisms. And this super bug is on the rise in Northwest waters. 2012 DSP levels in Puget Sound. 2012 DSP levels on Washington coast. As more people move to the Northwest and more land is developed, more fertilizers and nutrients runoff into waterways. Now add climate change to the equation. As we move into a warmer climate, scientists say, there will be a longer growth season for harmful algal blooms to flourish — both in the marine environment and fresh waterbodies. Algae thrive in warmer waters. They also like it when snowmelt flushes fresh water into the marine environment. That influx of fresh water makes for a nice layering effect and dinophysis knows how to use those conditions to their advantage. Trainer’s department at NOAA has spent hundreds of thousands of dollars developing equipment that will monitor algae and toxins in the water column. In the shellfish beds of Samish Bay south of Bellingham, Wash., Moore is beta testing the latest algae monitoring instrument. It’s called an Environmental Sample Processor and in about three hours, the ESP automatically collects water, analyzes the samples and sends a photograph that shows how many harmful algal species are present in the water at that moment. With the ESP, Moore can get word to public health officials much more quickly. Jerry Borchert is one of those public health officials. He’s the guy responsible for making sure all the shellfish harvested along Washington’s 800 miles of coast is safe to eat. The shellfish industry in the state generates $270 million annually. At the Department of Health lab north of Seattle, Borchert works closely with his team to analyze thousands of shellfish samples every year. If the toxin levels are too high, he closes beaches to shellfishing. This summer marked the first time he had to close beaches in south Puget Sound because of high levels of DSP toxin. But the trend, overall, has been upwards in recent decades. The Department of Health is spending $80,000 per year, on top of its regular budget, to test for the toxin that causes diarrhetic shellfish poisoning. That’s what made the Williford family sick. And it’s making Borchert’s life harder. He’s had to hire more staff, expand sampling sites and sample more throughout the year. “Things are constantly changing but changing in a more negative fashion so I have to do more to be prepared for this and it’s ongoing,” Borchert says as his shoulders slump. He has a resigned, tired look in his eye. “For every one thing we learn it seems to lead to 100 more questions,” he says. This season the Department of Health closed shellfish beds in six counties around Puget Sound because of high levels of DSP. Fortunately, no one got sick. But in the years to come, Borchert says he expects to be more and more busy. Story and audio by Ashley Ahearn. Video and additional reporting by Katie Campbell. Photos as credited. Michael Gale (Missoulian, Sept. 17) seems to think that events in Oregon’s Klamath Basin illustrate the danger of entering into a Flathead Reservation compact. Actually, the reverse is true. Part of the problem is that Gale doesn’t really appear to know what happened on the Klamath. What actually happened is that the state of Oregon determined that the Klamath Tribes have a “time immemorial” right to in-stream flows on Klamath tributaries, which entitles them to make a call on irrigators using water from those streams. And in this very low water year, that’s what they did. When a senior water user shuts down a junior, there is no implication that the senior’s use of water is “more important” than the junior’s. All it means is the senior was there first. It may not lead to the best use of water, but that’s the way Western water law works. It’s also important to note that the Klamath irrigators who were cut off this summer were not protected by any “paper agreements.” In fact, they declined to participate in the Klamath Basin Restoration Agreement, which seeks to assure that there is enough water, equitably shared, for both fish and agriculture. Other irrigators with rights junior to those of the tribes, who did enter into the agreement, have not had their water cut off. Like the Klamath Tribes, the Salish and Kootenai tribes almost certainly have a valid claim to extensive time immemorial in-stream water rights. These rights are a matter of law and not a creation of the compact. On the contrary, under the compact, the tribes have agreed to exercise their rights in a way that protects existing junior users, including irrigators. The Klamath experience demonstrates the value of this kind of negotiated settlement, and the perils of rejecting it. Almost 2,000 feet deep, Crater Lake is the deepest body of water in the United States, a beautiful gem of southern Oregon. Fed by overhead snow and rain, the lake is one of the cleanest and purest in the world. Gazing upon the breathtakingly bright blue waters of the lake is something you never forget. But there is trouble in paradise. During the past 21 years, I have spent my summers living in Crater Lake National Park. Looking out my bedroom window, I noticed winters are becoming shorter, warmer and less snowy. It looks to me like it has been raining more and snowing less in the months of May, June, September, and October. This change in the weather has led me to become very worried about climate change. The science confirms my observation. In 1931, rangers first began keeping track of the average annual snowfall at Crater Lake. Since then, the totals have been trending downward by decade from an average of 614 inches in the 1930s to about 455 inches last decade. Even more alarming, this last winter, 2012-13, Crater Lake received about 355 inches. Climate researchers expect the trend to continue. They predict the Pacific Northwest will experience even less snow and warmer temperatures in the decades to come. Most snow that falls in the park eventually leaves here to nourish the river sheds of southern Oregon such as the Klamath River Basin. Less snow falling in the park means less water is leaving the park to support southern Oregon cities, ranches, farms, and wildlife downstream. According to the National Weather Service, Southern Oregon is currently under a persistent drought that may last until the end of October, if not longer. This spring, the USDA designated Klamath, Lake, Harney and Malheur counties as drought disaster counties. According to the U.S. Bureau of Reclamation, the Klamath Basin experienced the second driest January-through-March on record. This current drought is an alarm bell telling us that it is time for Oregonians and Americans to stand up and take action on climate change. The National Academy of Sciences, U.S. Department of Defense, American Meteorological Society, and even the Catholic Church all say climate change is real and caused by humans. According to NASA, over 97 percent of climate scientists agree on this. It’s getting bad, but we can limit the damage if we choose. Humans pump more than 90 million tons of carbon dioxide a day into the atmosphere by burning fossil fuels, more than 33 billion tons each year. For over 150 years, scientists have known that CO2 traps the earth’s heat. Since the industrial revolution, we’ve increased the amount of carbon dioxide in our atmosphere by over 40 percent. Earth now has a “fever,” and the global average surface temperature has increased by 1.5 degrees Fahrenheit or 0.8 Celsius. The impact of climate change is felt worldwide by more extreme floods, heat waves, and droughts, like we are currently experiencing in southern Oregon. One of our leading climate scientists, retired NASA climatologist Dr. James Hansen, says the best way to reduce the threat of climate change is for Congress to quickly pass carbon fee and dividend legislation. A national carbon fee would tax fossil fuels — oil, coal, and natural gas — as they are extracted from the ground or arrive in port. This tax would cause fossil fuels to become increasingly expensive. At the same time, non-polluting renewable energy — solar, wind, and geothermal — would become increasingly attractive investments because of their relatively cheaper cost. Revenue from the carbon fee would be used to give Americans an evenly distributed dividend check to offset rising energy costs associated with the fee. The beauty of Crater Lake National Park and surrounding southern Oregon, plus the current drought, should inspire us to do everything we can to limit the threat of climate change for ourselves, our children and our grandchildren. The best way to limit future droughts threatening our farms, cattle ranches, salmon fisheries, and drinking water supply is to take action on climate change. That action, a national fee on carbon with revenue returned to households, will only happen if local Southern Oregon citizens tell our members of Congress, such as Congressman Greg Walden and U.S. Senators Ron Wyden and Jeff Merkley, to make it so. The Hoopa Valley Tribe applauds a recent decision by a federal judge to allow the federal Bureau of Reclamation to open the Lewiston dam and release Trinity River water needed to avoid a replay of the 2002 fish kill in the Klamath River. The lifting of the restraining order holding back these flows, which was requested as part of a lawsuit by the Westlands Water District and San Lois & Delta-Mendota Water Authority, is good news for this year’s record run of salmon. The fact that a last minute lawsuit could have caused a catastrophic fish kill in the Klamath River demonstrates the need for long-term solutions to water issues in the Klamath, and it’s largest tributary, the Trinity River. It is regrettable that this latest lawsuit has reignited the war for the Trinity River, one of the fiercest in the history of California water. At stake are Northern Californian’s way of life, including thousands of years of tribal existence, and commercial and sport fishing economies. In this suit, irrigators located hundreds of miles from the Trinity River revived arguments that water for salmon, environmental conservation and cultural preservation should more profitably be used to grow crops. These crops are grown with subsidized water on marginal lands. This latest attempt to use environmental laws to block water for environmental protection is especially hypocritical and deplorable if we look at the history of the Trinity water struggle. The last battle for the Trinity was twelve years ago. Then, a federal appeals court rejected similar efforts by these same water users that would have blocked salmon restoration in the Trinity River. The laws, permits and contracts that established the nearly 60-year old priorities for Trinity water are clear. Westlands and the San Luis & Delta-Medota Water Authority have always known that federal law gives Trinity needs priority over their use of Trinity River water, yet they continue to use obstructionist tactics to hold up water releases when the fish need it most. Moreover, the broad scope of the crisis affecting our fishery involves irrigation and hydropower generation in Oregon and the controversial Bay Delta Conservation planning process in California. Central Valley farmers are not the only party to blame for this crisis. If Upper Klamath Lake in Oregon was not overdrawn last year, and more water had been released from Iron Gate Dam, the Klamath River would not be in as dire a situation. If Warren Buffett’s PacifiCorp would stick to its promise to remove the Klamath Dams instead of stalling dam removal through the manipulation of California’s water quality laws, water would be cleaner and cooler in the Klamath. We cannot let wasteful corporate farming continue to diminish and pollute our rivers and groundwater to the point they cannot sustain fisheries or communities. The 2002 Klamath River fish kill was devastating not only the Tribes of the Klamath and Trinity Rivers, but also to coastal fishing communities. It was also a wake up call for the stakeholders of the Klamath watershed, including California and Oregon. However eleven years, and millions of dollars in hearings and meetings, later very few solutions to the problem have been implemented. There is a path forward. We have prepared long-term, comprehensive and science based solutions to the Klamath and Trinity crisis. We invite California and Oregon water managers to discuss them with us. Danielle Vigil-Masten is the chairwoman of the Hoopa Valley Tribe. On a June morning, Scott White and a colleague from his agency, the state Water Resources Department, park their pickup near a green pasture and barn outside Bly, Ore. A rancher, his wife and son meet the government men at the gate, their faces tight with barely suppressed anger. Low snowpack and stream flows prompted Oregon Gov. John Kitzhaber to declare a drought emergency in the Klamath Basin in April, and the watermasters are here to shut off the irrigation water the family needs to sustain their fields through temperatures pushing 100 degrees. This is just one of the hundreds of personal visits that watermasters are paying to ranchers and hay farmers who draw from the headwaters of the Klamath River, which runs 250 miles from southern Oregon’s high desert to the fog-shrouded redwoods of the California Coast. The crews, working in pairs, offer a sympathetic ear to frustrated ranchers, but carry radios and file itineraries with state police for their own safety as they step through wire fences and straddle ditches to measure stream flows, close headgates and turn off pumps. Anywhere else in Oregon, officials would simply phone people to tell them to turn off their own irrigation systems, says White, a 35-year-old who wears waterproof hiking boots and covers his bald head with a baseball cap on parched summer days. After a 38-year process, this March the state of Oregon recognized the 3,700-member Klamath Tribes — the Klamath, Modoc and Yahooskin people — as the most senior water-rights holders in the Upper Klamath Basin. In June, fearing the drought would decimate their traditional fishery of endangered Lost River and shortnose suckers, the tribes exercised their rights to keep water in the lake and upper tributaries that feed into the Klamath River. The federal government joined the tribes, using its senior rights to ensure the flow of water to 1,400 other farms on the Klamath Project on the California-Oregon border. Hundreds of Upper Basin ranchers and other junior water users, including federal wildlife refuges, were cut off; even Crater Lake National Park has had to truck in drinking water for campers. The tribes agonized over the decision, says Tribal Council Member Jeff Mitchell, knowing it would fan the flames of one of the West’s most intractable resource conflicts. People here have fought for generations over water and the fish, farms and hydroelectric dams it supplies, and the consequences have been widespread, including massive fish die-offs, toxic algae blooms in reservoirs and salmon declines that have closed 700 miles of coastline to fishing, from the Columbia River to Monterey, Calif. Some have worried that this summer’s drought might also kill the Klamath Basin Restoration Agreement, which was supposed to resolve those water-distribution conflicts while restoring habitat throughout the 15,000-square-mile Basin. Partly because many Upper Basin irrigators and others never signed on, the settlement has languished in Congress for over three years. But the latest crisis may actually provide the push needed to finally move the complex and fragile détente. Struggles over water in the Klamath famously boiled over in 2001, when the federal government halted water deliveries to Klamath Project farmers to protect endangered suckers and salmon. U.S. marshals were called in to protect irrigation headgates from angry demonstrators, who formed a “bucket brigade” to manually divert water to irrigation canals in an act of civil disobedience. The Bush administration resumed water deliveries the following year, but that left river flows so low during the fall chinook salmon run that thousands of fish died, devastating downstream fisheries. Three years ago, a coalition of dozens of onetime adversaries — including farmers, fishermen, tribes and environmentalists — signed a widely lauded truce. Under the agreement, the Klamath Tribes would not use their water rights to cut off the farmers who are part of the Klamath Project, a 1905 federal irrigation project that transformed an arid stretch of the California-Oregon border into productive farmland. The farmers agreed to accept less water during dry periods in exchange for greater certainty of deliveries from year to year. The tribes, meanwhile, would benefit from restoration projects and receive 92,000 acres of forest, a small portion of the 1.8 million acres they lost when the U.S. government dissolved their reservation in 1954. In a companion deal, the electric utility PacifiCorp agreed to remove four hydroelectric dams on the river, allowing salmon to return to parts of the Klamath and its tributaries that have been blocked for nearly a century. Pesticide program is uniquely Oregon solution to water quality issues. Lasting solutions to Oregon problems combine local know-how with practical advice from experts, provide measurable results, and work for both people and the environment. It’s the Oregon way. A uniquely Oregon solution to reduce unsafe levels of pesticides found in our waters is the Pesticide Stewardship Program, a program that has proven itself through pilots and, thanks to our governor and state legislature, is now a permanent part of Oregon’s efforts to protect human and aquatic health. The 2013 Oregon Legislature approved $1.5 million per biennium in state funding for collaborative, voluntary, locally led pesticide stewardship projects and community pesticide collection events in Oregon. Oregon’s Departments of Agriculture (ODA) and Environmental Quality (DEQ) will formalize and expand pilot projects that have already significantly decreased pesticide runoff. In some watersheds, such as Hood River and Walla Walla, these projects have reduced pesticides of concern by over 90 percent. In the Hood River Basin, orchardists successfully avoided development of a Total Maximum Daily Load (TMDL) for certain pesticides by voluntarily reducing pesticide runoff instead. As has been demonstrated by local leaders in Hood River, Wasco and Umatilla counties, effective voluntary stewardship programs can avoid a regulatory approach, provide flexibility and control to land managers, and enable pesticide users to address multiple pesticides at once with less time and cost investment. They can also provide Oregon with monitoring data and practical solutions to inform federal pesticide use discussions. Pesticide Stewardship Programs bring value to local land managers by giving them access to the resources of the state’s nationally recognized academic experts in pest, disease and weed management. These resources help land managers develop pest, disease and weed control strategies that maintain profitability, protect water resources and avoid regulatory risk. Community pesticide collection events enable pesticide users to anonymously and safely dispose of waste pesticides. This reduces costs for land managers and prevents leaks, spills and runoff. The new Pesticide Stewardship Program investments will be guided by the interagency Water Quality Pesticide Management Team, led by ODA and DEQ in collaboration with members Oregon Department of Forestry, Oregon Health Authority and Oregon State University. Oregon will also adopt this successful model. Allison Hensey is program director, food and farms, for the Oregon Environmental Council in Portland. Ken Bailey is vice president of Orchard View Farms in The Dalles, Ore. Lasting solutions to Oregon problems combine local know-how with practical advice from experts, provide measurable results, and work for both people and the environment. It’s the Oregon way.A uniquely Oregon solution to reduce unsafe levels of pesticides found in our waters is the Pesticide Stewardship Program, a program that has proven itself through pilots and, thanks to our governor and state legislature, is now a permanent part of Oregon’s efforts to protect human and aquatic health. Clean Water or Clearcuts for Oregon?